M&S has ended its historic relationship with accountants PwC, plumping for fellow Big Four big dog Deloitte. Marks & Spencer has dropped PwC as its auditor, ending a relationship of over 86 years, as European politicians continue to debate over how to chip away at the dominance of the ‘Big Four’ accountancy firms. A positively geriatric divorce. The auditors’ ivory towers aren’t cracking just yet though. 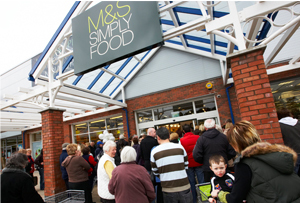 M&S kept its books within the Big Four, handing its contract to Deloitte, the company said in a statement yesterday. PwC, Deloitte, EY and KPMG audit an enormous 90% of UK PLCs. The bad bookkeeping news hasn’t stopped coming for PwC, who started auditing Britain’s favourite pants purveyor in 1926. The audit whale lost Berkeley Group to KPMG today, having been with the home builder for almost 30 years since they first listed in 1984. PwC's €21m (£17.6m) contract with brands behemoth Unilever was ended in July, terminating a 26-year relationship. It was also beaten this year by EY to the audits of commercial property company Land Securities and oil and gas big dogs BG Group. ‘Competition in the audit market is fierce and we do expect to see more companies switch auditor in response to regulatory change,’ a PwC spokesperson said, according to The Times. This unaccustomed flurry of competition comes at a convenient time, as the audit elite escaped wing-clipping in July, when the Competition Commission abandoned plans to force FTSE 350 companies to switch auditors every few years. Instead, listed companies have to put their audits out to tender every five years. Companies can still choose to stay cosy with their accountants though - tendering is a costly, bothersome task for auditors and switching is a bit of a palaver. However, things could still get more tricky for the Big Four, as European politicians sharpen their regulatory swords. In the meantime, the accountants have been expanding their more lucrative consultancy businesses – PwC announced plans to swallow up Booz & Co in October. Headline writers mourned.